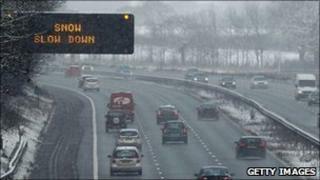 Motorists are being warned to take extra care on roads around the north west of England as the big freeze continues. Temperatures plunged to about -10C overnight, leaving a risk of icy patches forming on many roads. Travel operators warned that some bus routes were being affected by icy road conditions, particularly in Greater Manchester. Blackpool's match against Tottenham Hotspur was cancelled on Sunday. Despite efforts by rugby union fans, who helped clear snow and ice from the Edgeley Park pitch, Sale Sharks v Brive also fell victim to the weather. A spokesman said that "when the covers were rolled back the playing surface was unsafe". The Met Office said the region would experience a relatively sunny but cold day, with temperatures unlikely to rise above -1C. It warned that widespread ice would form on untreated surfaces producing dangerous driving conditions. "The public are advised to take extra care and refer to the Highways Agency for further advice regarding traffic disruption on motorways and trunk roads," said a spokesperson. The Highways Agency is making preparations in the event of any more snow falling, although it said the biggest challenge to motorists was ice. Brian Hensby, North West Operations Manager, said: "When the signs say 'snow or ice slow down'... use your common sense and please slow down. People have been driving a little bit fast. "The road looks wet, it probably is, but with the falling temperatures the grit doesn't work below -10C, therefore there's a risk of icy patches." One of the worst-affected areas of Greater Manchester was Bolton, where gritters have been working around-the-clock since Friday. The council's fleet of nine gritting vehicles have spread more than 460 tonnes along 317 miles (510km) of road, the authority said. Teams were due to clear snow from town centres and bus stops, and refill grit bins on Monday. Manchester and Liverpool airports are open as normal, with some disruption to services because of adverse weather elsewhere in the UK and Europe. First Bus said its services in Wigan, Rochdale and Oldham were only operating on main roads and there is also disruption to a handful of routes in Bury and Bolton. Merseytravel, which oversees trains, buses and the Mersey Ferries, did not report any major weather-related disruption.